Customers expect engaging online experiences on all devices, but that doesn’t mean you need to sacrifice time, budget, and brand consistency by creating individual sites for every device. With responsive design, you can create one well-planned site to deliver an optimised experience in context to each device or screen size. 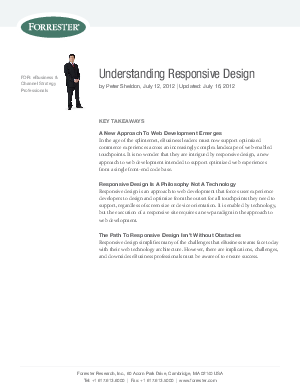 Download Forrester's Understanding Responsive Design report and find out how you can use this emerging approach to simplify your mobile content strategy, and deliver compelling customer experiences.